We deliver professional services to our range of private, corporate and institutional customers throughout Greater Manchester and the North West. 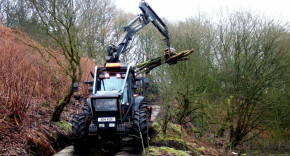 Our treework, woodland management, consultancy and subcontracting services used to be undertaken under our trading names of Ecos and Ecos Consulting. All of these, as well as arisings disposal and haulage are now provided directly by the TreeStation. All our areas of business share the same values, approach to health & safety, well-maintained equipment and our collective effort to deliver customer-focused and environmentally-sensitive services.